Doug Colman: I can’t remember, it might have been ’91 or ’92 and you were there at the time, but I think it was after the Scotty Baldwin thing where Coach Osborne actually called a team meeting and he came up all teary-eyed and said, “The media is calling us ‘The Miami of the Midwest.’ ” And it hurt him so bad that they were thinking, that people considered us at the time -like Miami- convicts and all, you know? We didn’t want to be associated with anything like that. I remember his eyes tearing up. I remember my eyes tearing up. I just wanted to go out and wreck somebody now, because of the way he felt. And that’s what good coaches do. They know you’re big guys, but at the same time you play emotionally and you want to do things for those people, too. That’s the way a lot of guys felt when we played. Q: Speaking of wrecking somebody, Doug, I think it was the fourth quarter against Miami and you had just the sweetest tackle against their fullback, James Stewart. How did you guys operate back there? How much was emotion, how much was reaction? What was the linebacking corps’ mindset? DC: After that tackle? Put it this way: after that tackle I didn’t get up and jump around, nobody got up and jumped around on me. That’s how tired we were at that point, where it was just about preserving our energy. It was that kind of thing, and we ended up in the fourth quarter and it helped to decide that game. But one thing about our linebacking corps: we were very, very close. And when things were wrong, when things didn’t go right for us, we really came together. As a group of guys we came together. They were a great support system at the time, from my freshman year on. You had guys go through the same things you were going through, and it was really good to have those guys around. And it was great in the respect that you talk about leadership? When you talk about those teams? You passed it on. You were always trying to groom the guys. You got groomed, and then you were getting the young guys ready for the time they were seniors, so they were ready to take over. That’s one other difference I see in college football now, I don’t know exactly how many teams have done that, but it really seemed like: you pay your dues, you work your tail off, and this is usually what happens to you in the end. It’s usually good things for you. We were that way, it was really a good group of guys. Q: Who groomed you and the guys in your class? DC: Coming in my freshman year, I was really close to Mike Anderson, to Troy Branch. Mike Petko was part of that group, but he was kind of an oddball. (laughs) I’m friends with the guys now and he’s a different guy, but he was one of those guys that really tried to take it to you. Troy is from New Jersey, and Mike Anderson was my host when I first got out there. Phil Ellis played with me. Those other guys that would come up, the younger guys like Jon Hesse, Ryan Terwilliger, Matt Penland, who’s now our team chaplain and his younger brother Aaron Penland, we were all really close. Q: And some of the guys you passed things on to? DC: I’d say John Hesse and Terwilliger. Jay Foreman coming in at that time. And that went on for a while. I think it was something that happened and continued during Solich’s time. And somewhere along the way, I don’t know if they lost their focus on exactly why they were here… or kids may have thought too much about the NFL or what. That may be the original reason why you’re coming to a place, but that shouldn’t be the final reason while you’re there. And like I said before, the whole experience changed me as a player and a person. Q: Looking back, what would you say is the greatest benefit from your time as a player? DC: I’d tell you ‘my wife.’ (laughs) Because, again, I didn’t meet somebody who was the same as me. I met a woman of higher standards and higher morals than I had, but again, those are all changes for the good, you know? I tell you what, I learned a lot. I’ll tell you this, I took what we did here at Nebraska -from the strength program to the way things were run to the practice organizational things- and applied it to a high school program that never really had a history of winning, and we had great success. You could almost say we had instant success. Even that first year, we lost a couple of close games we should have won, and kids believed in it. I just got back from New Jersey a few days ago and I saw a kid who I coached in high school. They’re all in college now, and basically, they come back and tell me the same thing, “Coach, what you taught us is more advanced than what we’re doing now. What you did in strength training is more advanced than what we’re doing now.” They’re Division 3, but it’s the time you put in and the guys you hire. And I say it jokingly, but I mean it: you have to brainwash them. 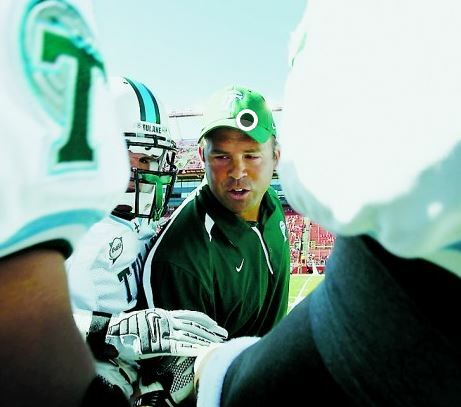 You have to brainwash them that, “this is the way it’s supposed to be done.” I’d say, ‘I walked away from Nebraska and had five conference championships, two national championships, got the opportunity to play professional football,’ and I had a great platform to come back and get kids to believe in that. And the next step is to get coaches to believe in it, and then the next step is to get the parents to believe in it. And the last step is to get the administration to believe in it.” (laughs) The administration part of it, in the end that’s what gave me kind of the sour taste in my mouth about the high school thing. I felt bad about leaving, I probably could have done that for a while and been happy and not have gotten this bug to coach at a higher level. But it got to a point where I was just busting my tail and doing all these things I could do and trying to help the school out, and everybody wanted to know, “Why are you doing this or that? What are you supposed to get out of it?” And I’m like, ‘I just want this to be the most special high school in the area. I want this to be the best it can possibly be.’ And not everybody plays the game that way. Q: They’re not used to pushing to be the absolute best because they’re willing to settle? Willing to hanker down into that comfort zone rather than be vulnerable to failure by pushing the envelope? DC: Yeah. For me, I don’t want to be around those people. Because in the end, it’s a horrible place to be. Whenever you don’t surround yourself with people who want to be the best at what they do and when you’re not in control as to who is on your team, it’s a horrible thing. It’s a horrible feeling. And again, in comparison here I was able to be coached by one of the winningest coaches in all of college football, and probably the most respected. And I say that because one of these last Coaches Conventions they had Coach Osborne and Coach Joe Paterno up on the stage, and basically Coach Paterno was cracking jokes and people were laughing. And Coach Osborne is up there, sincere with an occasional tear in his eye as he’s talking about things, to the point where he stole the crowd. Joe Paterno was seeing some of the things Coach Osborne did, the way he managed things, and Joe Paterno said he was going to go home and apply what Coach Osborne said to his team. So here’s a guy who’s likely the winningest coach of all time and he’s saying that Coach Osborne has a better idea than he does? For me, I can honestly say he’s probably the most respected coach at this point in history. I take a lot of pride in being able to say I played there at Nebraska. And another thing: there was a thing in the NFL -when your college team plays another teammate’s college?- there’s a friendly wager of something like a hundred bucks. And it doesn’t matter if it’s like a MAC school against a Big 12 or a Big Ten school, you’re still gonna place that $100 bet. 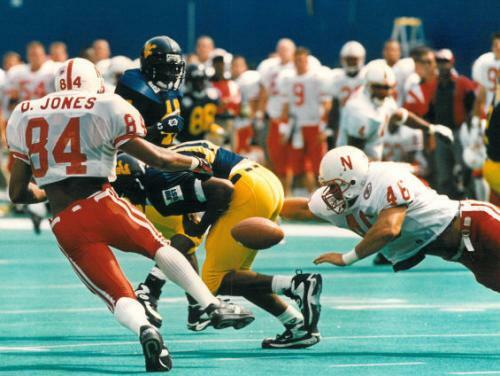 It’s funny, there were weeks when Nebraska was playing some other guy’s team… and nobody would lip off to me about their team playing Nebraska because they didn’t want to lose that bet. (laughs) No lie, I didn’t bet once. Not once. And I didn’t bet anybody or go after them to force a bet either, because we were Nebraska and we dominated everybody. That’s what my thought process was: ‘It’s no fair to them, we’re just that much better.’ And then to see where Nebraska was at (after the Pederson/Callahan years), in my mind it was like, ‘Wow!’ It was hard to come to grips where you just didn’t believe it got to the point it was, because that wasn’t the way it was supposed to be. Q: Unity, Belief, Respect, huh? DC: Absolutely. And I believe Nebraska can make it happen again, because Nebraska is a special place. Everybody in Nebraska looks forward to Nebraska football. There aren’t many places can say that. Everybody has a lot of love for the program, and there isn’t a whole lot of people that hate Nebraska around the country because they respect them for who they have at the helm and the way they play. 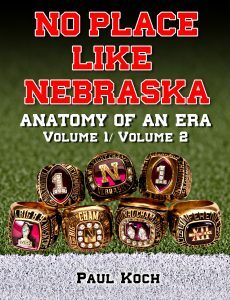 Q: Doug, that’s why I’m titling the book “No Place Like Nebraska.” Because I think there’s a special dynamic, a unity that makes those teams achieve more than anybody gives them credit for. And they have that fighting, pioneer spirit. DC: I couldn’t agree with you more, because I say it all the time when I do speaking engagements and stuff. I say, ‘Look, we give so much homage to the ’94 and ’95 teams for the championships they won, but I feel horrible, absolutely horrible for those guys on the ’93 team.’ I honest to God do. I say that that game was taken away from us. And if you talked to Coach Osborne about this, I’ll bet he’d say there were 4 games in his entire career where they took it away from him. And that ’93 team and the Orange Bowl loss to Florida State was completely manipulated by the refs. It’s just a shame, because at the time when we went to school it was “Coach Osborne can’t win the big game.” And then all of a sudden here’s the first national championship and then the following year in ’95 we steamroll everybody, and then he’s the guy who they say “He’s a win-at-all-costs coach.” And that’s one thing I never enjoyed about that, either, you instantly get to that point and then everybody gangs up on you because you’re successful. DC: Right. And if you remember, we had four guys, five guys! We had Damon Benning, Clinton Childs, Ahman Greeen, James Sims. Sims! Sims would be starting at most schools at running back. And you put him in at the end of the game versus the University of Florida? He almost scores if he doesn’t trip on his first carry. And then we just down the ball (to end the game). It was crazy. And here’s the philosophy, what I believe was Coach Osborne’s philosophy. I don’t know if it is or if he’s ever said it this way, but my philosophy is this: ‘You give a kid every opportunity he needs to succeed until he starts doing things that are gonna affect the guys around him.’ Once he starts affecting the team, then you’ve got to get rid of him. That’s the thing. If you’ve got kids who have issues or problems, hey, you need to work with those kids and try to straighten them out. And it’s your job to do that. But when he starts doing things that are affecting the guys around him, attitude, bringing them down the wrong road, where you know these aren’t changeable habits that you can change in this kid, then it’s time to hit the road. That’s how I approached coaching high school and that’s how I would approach business. If guys aren’t doing what they’re supposed to do, you have to get rid of them. And in business I’d probably have a shorter fuse. But of course, in business you aren’t dealing with kids so much. But you expect them to abide by and do what they’re supposed to do. That’s why you shouldn’t get me talking about this kind of stuff. I get to walking around and get all worked up about it. ”Hey, there’s something bigger than me here.” I’ll bet that if I were to ask every single student-athlete of those 60 & 3 seasons if Doug’s quote rang true to their own experience, every one of them would concur. It was quite refreshing to hear of his change of heart and how it completely altered his approach to football, as well as life and leadership. It’s already been pounded into our heads ad infinitum, but I still find it amazing the myriad ways Nebraska walk-ons contributed to the character and influence on those teams. I hope you don’t discount their interviews here as lesser than, either, for their points are just as valid as the more prominent stars of those days. Before the Unity Council ever was gathered, there was first the small group I’ve chosen to label the “Unity ‘Backers.” What am I talking about here? Well, the linebacking group of the day had an extremely tight bond within its own little confines due to the nature of their position coach Kevin Steele’s maddening and often de-spiriting ways. (Coach Steele did not answer requests for this project to refute this claim.) The more recent, eclectic addition to the ranks of the Husker Coaching staff in 1989, this fellow was -how do I put this?- unique. Yeah, that’s the word. Unique. Often a complete antithesis to the mien of a Tom Osborne -but a technician unequaled all the same- there was no love lost between most of the linebackers and their master of those days. To put it bluntly, you didn’t play for Kevin Steele as much as you survived Kevin Steele. And in order to outlast the man and maintain a shred of composure, of dignity and the fight to press on, these guys leaned heavily on each other as they daily bore the brunt of sometimes brutal, demeaning, and somewhat unfair treatment from their tutor. I suspect that it was his Southern charm during recruiting that ultimately won him the job (he landed Tommie Frazier). 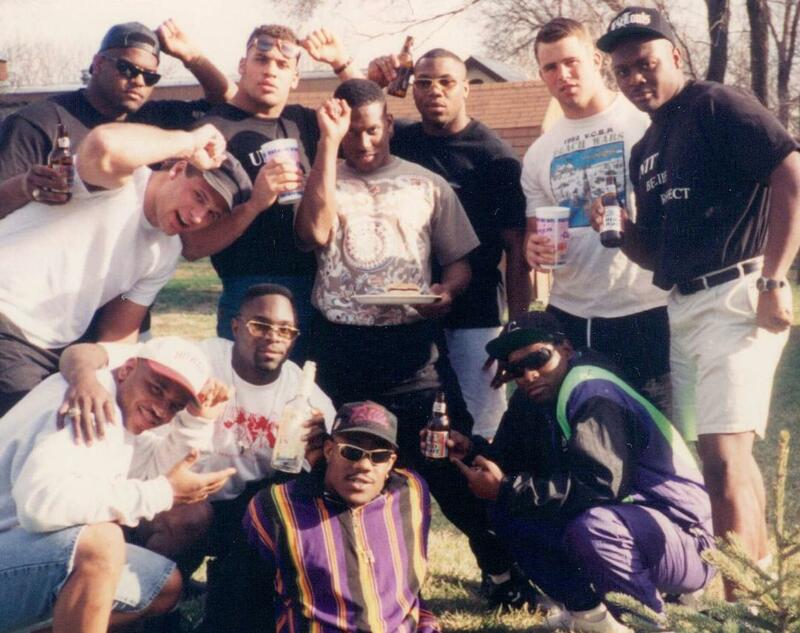 Regardless, the brotherhood and unity of those linebackers was a small test run, a forerunner to the Council of future days, and these guys proved how a unified front could outlast and defeat most any foe, within or without.